Baked eggs for dinner? 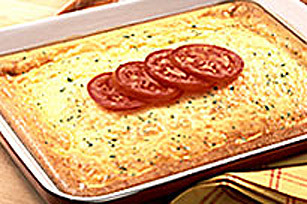 You bet - eggs played up with a few on-hand ingredients give you a baked omelette you can serve any time of day. BEAT eggs with Miracle Whip and milk until combined. Stir in cheese. POUR into greased 13 x 9 in. (33 x 23 cm) baking dish. BAKE at 350°F (180°C) for 45 min or until set. Use another KRAFT Shredded Cheese or add OSCAR MAYER Real Bacon Bits and a colourful combination of spring vegetables.